The opening of the St.Katharine Docks in 1828. Unlike earlier docks, there seems to have been only a modest ceremony, with no state officials of note attending. Taking part on that occasion was the Mary, a ship that traded with Russia. On its deck were forty veteran sailors who had served under Nelson at the Battle of Trafalgar, collected from the Greenwich Hospital. The ending of monopolies in the 1820s, granted to the early 19th century London docks, brought an opportunity to create the St.Katharine Docks beside the Tower of London. Yet their arrival signaled the beginning of a new competitive era for the docks and lower profits for their owners. It was the workers who were to ultimately pay the cost. 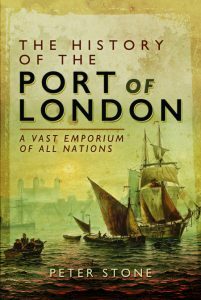 The expanding British empire and the Industrial Revolution generated an immense amount of trade passing through the Port of London. Until the beginning of the 19th century all goods were landed or loaded at wharves on the open river. In order to alleviate shipping congestion on the Thames, as well as to combat the theft of cargoes by criminal gangs, a group of merchants dealing with the Caribbean, primarily importers of sugar and rum, created new enclosed, tide-free docks for their ships. The West India Docks opened downstream of London on the Isle of Dogs in 1802. Other general merchants quickly followed suit, opening the London Docks at Wapping in 1805. The long-established East India Company opened their own docks at Blackwall, to the east of the West India Docks, in 1806. On the south side of the river several groups of timber merchants were developing a series of docks at Rotherhithe. At the same time Parliament passed a new law that deferred customs duty on imports until goods left the port. That allowed for the first time the possibility of cargoes being trans-shipped without payment of duty. London thereafter became an entrepôt, whereby goods could pass through the port on their journey from one part of the world to another and thus further increase trade in the docks and wharves. In return for their considerable investment in creating the docks, the owners of the West India, London and East India Docks were each granted by Parliament a twenty-one year monopoly on certain goods to and from particular areas of the world. Those monopolies were due to expire in the mid-1820s. Tonnage passing through the port had continued to rise and several groups of investors and engineers (including Isambard and Marc Brunel) began to make speculative plans for new sets of docks along the Thames to take advantage of the forthcoming free trade. Immediately to the east of the Tower of London and the City, along the riverside, lay the ancient district of St.Katharine’s. It traced its beginnings back to the early 12th century when Matilda, wife of King Stephen, founded a hospital, meaning a place of shelter and rest for travelers, the sick and the elderly, where they could be cared for by the resident brothers and sisters. From the mid-13th century, during the time of Queen Eleanor, wife of Edward I, the Foundation of St.Katharine came under the patronage of either the queen consort or reigning queen. The hospital had its own church and during the Middle Ages its surrounding land – or ‘liberty’ – developed into a densely-populated community immediately outside London. The first threat of redevelopment of St.Katharine’s came in 1796, when the City of London Corporation applied for an Act of Parliament to convert the district into a wet dock. Protected by Queen Charlotte, consort to George III and patron at that time, the attempt failed and, as we have seen, the city merchants instead created their new docks at Wapping, the Isle of Dogs and Blackwall.